Living a Fit and Full Life: Renew and Refresh Your Skin with Exuviance! Discover dermatologist developed skin care products that are clinically proven to dramatically transform all skin types. Through scientific innovations and patents, Drs. Van Scott and Yu have perfected the science of anti-aging skin care to an extent that is unprecedented and unsurpassed by any other skin care brand. Our latest antiaging breakthrough masters a triple action approach to skin renewal in a single yet powerful treatment with a unique blend of physical, chemical and enzyme rejuvenators. 100% of users saw improvement in fine lines and wrinkles after one month of twice weekly use of this high performance Alpha Hydroxy Acid peel. A 25% blend of AHAs and PHAs including Glycolic Acid, Mandelic Acid and Gluconolactone that exfoliates dead, dull surface layers, and enhances the process of cell renewal, to reveal healthier cells. Harper's Bazaar Editor's Choice "The Beauty 150" Award winner! 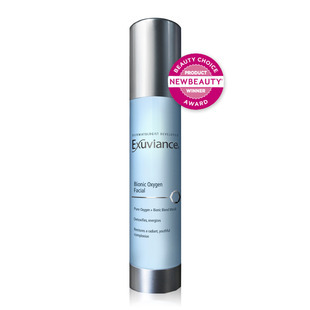 Renew and refresh your skin with Exuviance! 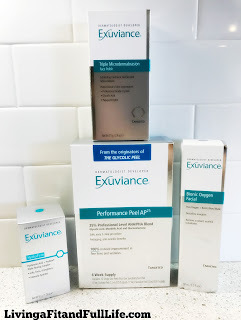 I've only recently discovered Exuviance even though I've heard good things about them for quite some time now. 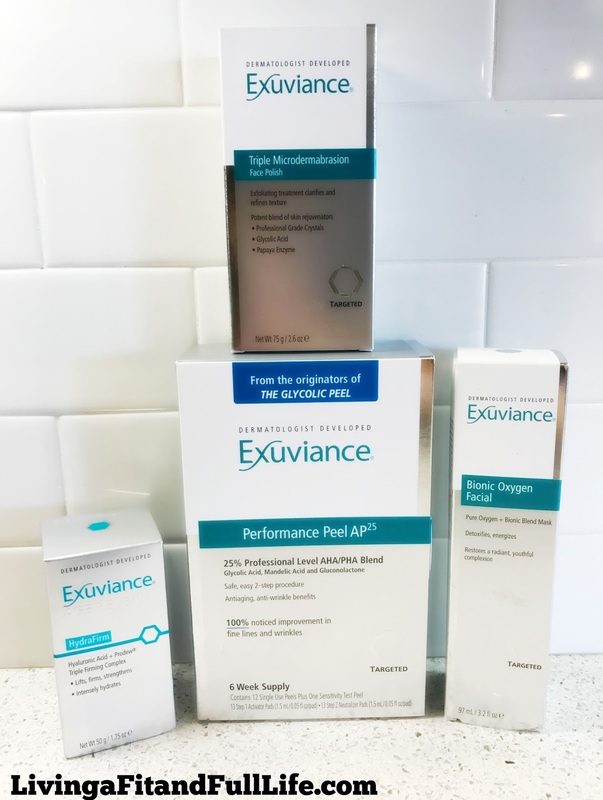 Exuviance has recently come out with a few new products that I'm absolutely loving! Exuviance Triple Microdermabrasion Face Polish contains a unique blend of physical, chemical and enzyme rejuvenators to get your skin looking it's best. It also contains professional Grade Crystals to give you noticeably smooth skin. 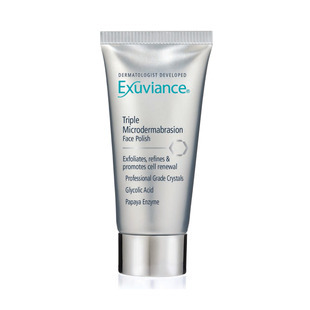 Exuviance Triple Microdermabrasion Face Polish is the perfect way to smooth skin, leaving behind a bright complexion. It also helps your makeup glide on with ease! Exuviance Bionic Oxygen Facial delivers an infusion of pure essential Oxygen to detoxify and re-energize skin to restore a youthful, luminous complexion. This is an amazing product to restore your skin's youth and luster. If you're suffering from a dull complexion, this product is a must have in your beauty routing. 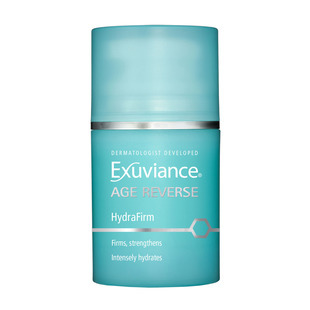 Exuviance Age Reverse HydraFirm contains Hyaluronic Acid and Prodew® to actively restore moisture. It's the cure for dry skin and I love how quickly it hydrates my skin! I've also noticed that my skin looks much plumper and healthier than ever. It's a terrific way to restore dry skin! 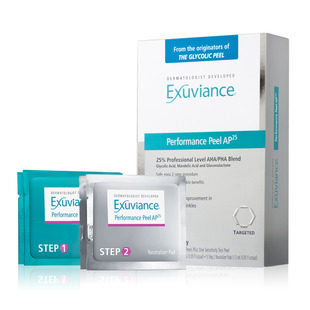 Exuviance Performance Peel AP25 is a phenomenal product! With 100% of users seeing an improvement in their fine lines and wrinkles, I just had to try this product! Exuviance Performance Peel AP25 was also Harper's Bazaar Editor's Choice "The Beauty 150" Award winner and for good reason. It works wonders to help reduce wrinkle and fine lines, leaving behind a youthful glow, even skin tone and texture. I absolutely love this product and highly recommend it! Click HERE to learn more about Exuviance! Follow Exuviance on social media!